The National Highway Traffic Safety Administration says that in 2014, “Motorcyclist deaths occurred 27 times more frequently than fatalities in other vehicles.” The injury rate was 6 times any other roadway motorist. In over 40 years of data tracking and monitoring, the results have not changed significantly: motorcyclists are at risk no matter how experienced they are, no matter how close to home they stay, and no matter how slowly they are moving. Any motorcycle driver on the road is in danger of a fatal accident, particularly if he or she has consumed alcohol or fails to wear an approved helmet. One of the most definitive pieces of research on motorcycle cycle safety was published by Professor Harry Hurt of the University of Southern California, in 1981. While some of the data has seen changes as social trends and manufacturing practices have shifted, many of the findings are still considered industry standard, and have been supported by more recent studies. In general, today as then, overall experience riding us not a mitigating factor, nor is the length of the trip. Sticking close to home, staying at slower speeds, and being skilled at operating the machine aren’t enough to prevent injuries or deaths. Another important finding of the Hurt report that remains a critical issue today is the role of alcohol or other substances in nearly half of all fatal crashes. These high incidences of accidents are not always due to failures on the part of motorcyclists, but on the actions of other vehicles around them, which has led to widespread campaigning for motorcycle road awareness and sharing from drivers of other vehicles. When it comes to motorcycle fatalities, however, the causes become more narrow. Road rash doesn’t carry the same consequences as trauma to the spine or brain. Given modern advances in medicine, many of the injuries sustained in motorcycle accidents are no longer fatal. However, those accidents involving brain trauma remain the deadliest to riders. Despite the obvious preventative benefits of helmet use, and the laws in California making use mandatory for all motorcycle riders and passengers, not all riders consistently wear approved safety helmets. Likewise, the laws in California regarding intoxicated driving are clear, yet alcohol and drug related roadway fatalities continue to rise. For those who have been injured or lost a loved one in a motorcycle accident, there is no statistic or study that will take away the physical and emotional pain. But when the negligence of another driver or a defective part led to the accident, then some action may be taken to see justice. 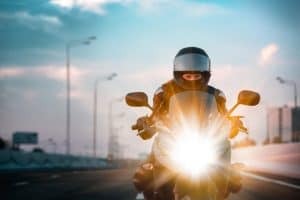 If you were injured in a motorcycle accident, as a driver, passenger, or bystander, the law firm with a noted history of supporting accident victims across Southern California is here for you. Call Taylor & Ring today at 310.776.6390 or complete our contact form to schedule a consultation with an empathetic Los Angeles motorcycle accident lawyer.